One of my roles is working part time at InterHealth Worldwide, where we support humanitarian aid workers, mission workers and government agencies. I wrote about my work in Counselling at Work’s Summer 2015 issue in an article called ‘Working on the Edge’ following a presentation at the BACP Practitioners’ Conference earlier in the year (Dunkley, 2015). InterHealth Worldwide is an international health charity preparing, sustaining and supporting the health and wellbeing of individuals working around the world. Some of our clients who are aid workers overseas feel they have a calling and are passionate about creating a safer and better world. By the very nature of their work, they are exposed to traumatic stories. Many who work in the field conform to a stereotype of a person who can be self-sacrificing with a tendency to overlook their self-care for the greater cause, to overwork, to hold unhealthy boundaries around responsibility and to feel a weighty guilt if they let others down. These stereotypical traits found in humanitarian aid workers can also apply to therapists and leave individuals particularly vulnerable in the current climate. It’s not unusual to hear individuals say, “I’m doing the job of two people.” When targets become a priority over how staff are treated, morale is lost, productivity is reduced and staff may become paranoid and mistrustful, leading to an unhappy working environment. This is ironic, given that target-driven organisations were originally developed to improve healthy competition between staff and departments. However, in some organisations the targets have become so unrealistic that a highly stressful environment has been created which may lead to staff finding ways to conceal data and with conflicts arising, potentially resulting in harassment and grievance cases and a high rate of staff turnover. As I facilitate more presentations on trauma, I hear counsellors over and over again confiding in me about how they “hit burnout” and of organisations that are limited in what they can offer to protect their therapists because of a lack of resources, a focus on targets and a lack of understanding of the psychological impact of working with trauma. 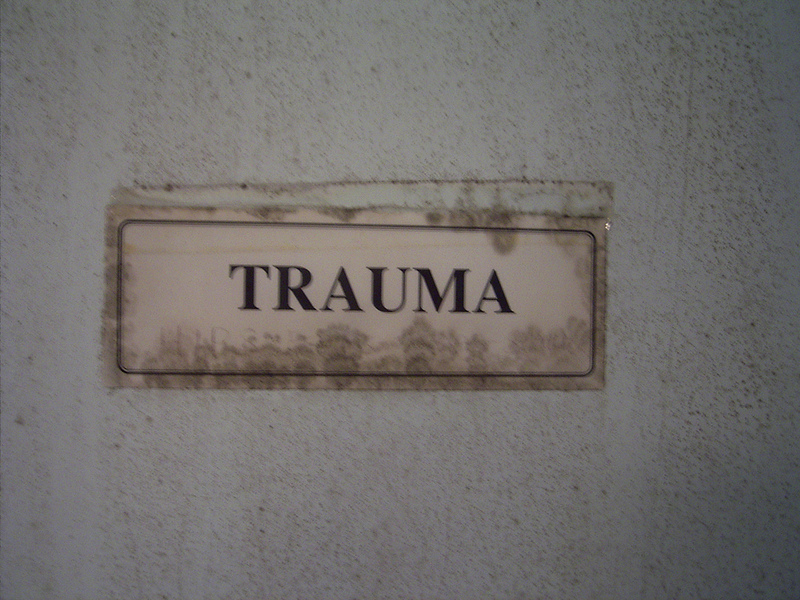 When we work in organisations, it helps if we have some awareness of systemic trauma; by this I mean, how does an organisation that deals with trauma prevent itself from becoming traumatised? This is an important question for those involved in the field of providing therapy in organisations and has consequences for the therapist. ‘There is a cost to engaging with the stories and lives of distressed and traumatised people that can result in the carer experiencing symptoms similar to those of the people that they are supporting (Tehrani, 2010). My interest in self-care and burnout prevention led me to undertake some research in which I discussed burnout and vicarious trauma with therapists working in the field of trauma within organisations. It was a small-scale study using a questionnaire I designed, specifically asking therapists who work with trauma of their experiences and understanding of vicarious trauma and burnout. For clarity, vicarious trauma, sometimes called compassion fatigue or secondary trauma, is the emotional residue of the exposure that carers experience from hearing their clients’ traumatic stories. Burnout is cumulative and is often a result of high demands or prolonged stress in the workplace. The majority of participants had experienced symptoms of burnout or vicarious trauma at some point in their career. Reasons for experiencing burnout were stated as workload, lack of support from management, lack of autonomy and pressure from unrealistic deadlines or targets. Michael Leiter and Christina Maslach, both Professors of Psychology and known for their pioneering research on job burnout, devised a model that highlights six specific sources of burnout at work – lack of control, conflicting values, insufficient reward, work overload, unfairness and the breakdown of community. Interestingly, many of the therapists stated that, as they completed the form, they became aware of how much more they were impacted than they had previously realized (Leiter and Maslach, 1988). 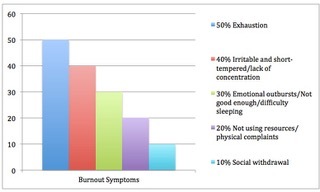 The most widely used measure for assessing burnout is the Maslach Burnout Inventory (MBI) developed by Christina Maslach and Susan Jackson, psychologists at the University of California (Maslach and Jackson, 1981). Personally, I find the MBI particularly useful and recommend that individual therapists and teams of therapists use it regularly, as too many are prone to overlook the signs of burnout until it is too late – for example when they are signed off sick or leave the organisation. I also recommend regular reviews and discussions on this topic between practitioners within organisations and suggest that therapists check their own personal levels of burnout and review their self-care strategies. Maslach and Jackson view burnout as a three-dimensional syndrome, made up of exhaustion, cynicism and inefficacy. Feedback from my questionnaires stated that the top three symptoms recorded for burnout were exhaustion, feeling irritable or short-tempered and difficulty concentrating. The top three symptoms recorded for vicarious trauma were feeling helpless, feelings of anger or despair and physical complaints. One of my supervisees worked with women in domestic violence situations. After a particularly difficult session and as she left her counselling placement, she suddenly felt “fearful” and “unsafe”. She quickly got into her car and locked all the doors. She described feeling “jumpy” for several days. We discussed the impact of vicarious trauma and countertransference and how to manage this during and after a session. I also listened to a colleague as she told me about her experience of working as a social worker in a children’s home for abused girls. She began to “switch off from the emotional content” and felt “numb” and “disengaged.” She said she felt “helpless” and “not good enough”. All of these reactions are common symptoms of vicarious trauma. Having worked in the NHS within a forensic sexual assault unit for four years, I personally believe some jobs have a shelf life. I knew that by the end of those four years, I had ‘done my time’. I loved my job, felt passionate about what I was doing and could see the value in my role, but I knew the shelf life of this job had come to an end. I was experiencing compassion fatigue and I had become immune to some of the distressing stories I was exposed to. Some of the therapists I talked to stated that they too left their jobs due to burnout and/or vicarious trauma and I have colleagues who feel they can no longer work with trauma and look for alternative careers. So what is it that we as therapists, at both a personal and organisational level, need in order to better protect ourselves from these psychological workplace hazards? In my questionnaires, the main support requested by therapists from their organisations was access to quality specialist trauma supervision. An additional point was made about the need to be able to have access to supervision in an emergency situation. Interestingly, in Tehrani’s study of caring professionals, she points out that fifty per cent were vulnerable to compassion fatigue, that the incidence of compassion fatigue can be reduced when the carer has access to professional support and she identified that the importance of regular personal and professional supervision is essential (Tehrani, 2010). It was also clear from the research I undertook that therapists needed managers to have training and awareness in both vicarious trauma and burnout and to be approachable if an individual felt they were struggling or needed further support. Caseload management was mentioned, particularly focusing on the weight of trauma cases. Therapists requested some flexibility and an opportunity to vary tasks. For example, they often spoke of the need to have ‘space’ in their work, time to reflect and carry out administrative processes. However, sometimes this can be seen as ‘time-wasting’ or ‘non-productive time’ in organisations and is not factored into either diary time or client time. Ideally, managers need to role model good self-care. However, it’s not unusual to hear therapists mention instead that their managers overwork, which can in itself be a symptom of vicarious trauma. This is something that I hear frequently from staff working in the humanitarian field or from first responders. Interestingly, Tehrani notes that spirituality has been shown to have a significant impact on resilience in improving recovery rates in patients and to reducing the incidence of post-traumatic stress in carers. Working in this arena, I know that if I have experienced a particularly heavy trauma session I may carry out some mindfulness, grounding or EFT exercises, sometimes with the client, if appropriate. Other strategies I use include changing the energy/space in the room by moving things around or opening the window and taking a short stroll or making a cup of tea. I think it is important that we tune in to our physical state directly after sessions and listen to our bodies to inform us of what we might need in that moment. I rarely watch the news late at night and limit my exposure to traumatic material outside of work. 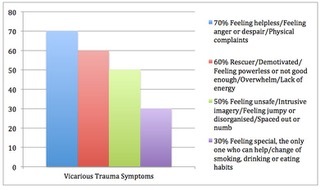 It seems that we all need to be more aware of the warning signs and symptoms of vicarious trauma and burnout, to be able to identify them for ourselves and also watch out for our colleagues. I remember a member of staff who worked in the emergency response team stating that, after the 7/7 bombings, he couldn’t stop working. When his manager told him he needed to go home and get some sleep after being at work for over 36 hours, he became angry. It wasn’t until he got home that he realised just how much he needed the break and how exhausted he was. Certainly, organisations need to become well informed of the psychological risk hazards in the workplace for therapists and have clear stress and trauma policies in place to support their staff. However, I want to conclude by highlighting that burnout and vicarious trauma are not related to a therapist not being resilient enough but are normal responses to the type of work we are exposed to. You do not have to look far to find stories of therapists experiencing these symptoms and there is a great deal of research to support why this happens. Therefore, individuals and organisations need to have greater awareness and knowledge of how to protect ‘the carers’ of our world, so that we can continue to carry out the great work that we do. This entry was posted in Trauma and tagged Caring for the carer, PTSD, Trauma by admin. Bookmark the permalink.